Kate is the film archivist, media cataloger, and cultural film series programmer for the Penn Museum. This program will consist of a brief introduction to US Imperialism in the Philippines, followed by a guided viewing of an independently made 1913 propaganda film that argued Filipinos were not fit for self governance. The film was produced at a time when the debate within the US Congress surrounding the Philippines status as a US Territory began to favor granting their independence. Native Life in the Philippines (1913) was a collaboration between Dean Conant Worcester, Interior Minister of the Philippines who served as director/producer and camera operator Charles Martin. Worcester is highly controversial for his views of native peoples and for the racial agenda that he promoted in support of his own personal gain as a land-owner in the Philippines under colonial rule. The film was made near the end of Worcester’s career and was produced as a work of propaganda in support of keeping the Philippines under US territorial administration. Shortly after the film’s completion, Worcester left office and embarked on a lucrative lecture tour in the US. The following year Martin became the first director of the photography lab for National Geographic magazine. Beginning with Thomas Edison’s 1898 documentary news reel footage of the Wreck of the Battleship Maine and subsequent coverage of the Spanish-American War, film has played an important role in the way that Americans understand and consume conflict. As the technology used to produce motion pictures improved and Hollywood became increasingly intertwined with the military industrial complex, economic and cultural conditions of wartime America both necessitated and encouraged through capital gain the integration of anti-Japanese propaganda in major studio films spanning the war years 1942-1945. 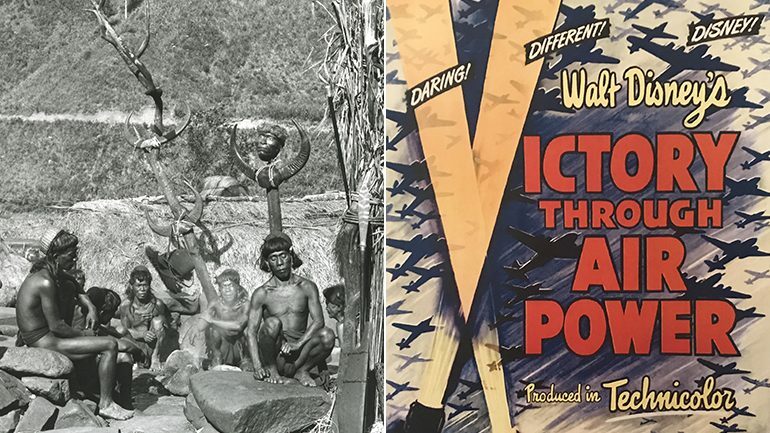 This program will provide a brief history of the Hollywood Studio system’s emergence as the hegemonic gatekeeper of American popular media, followed by a guided viewing of anti-Japanese WWII propaganda films. Content is derived from a variety of sources, but this lecture focuses primarily on entertainment based Hollywood films (fictional narratives), documentary news reels and soldier training films produced by the US Military sponsored War Pictures, and cartoons.